The Bills came out firing on their opening drive, with five drop backs (4 pass attempts) by Tyrod Taylor, against the top pass defense in the NFL. He only completed one pass to Zay Jones for 10 yards before Buffalo punted. Jacksonville would also attempt three passes before handing the ball off to Leonard Fournette twice. A drive that started on their own 30 ended with a 55 yard Josh Lambo field goal, thanks to a 22 yard reception by Dede Westbrook. With 8 minutes remaining in the first quarter, LeSean McCoy finally touched the ball, including a 23 yard screen pass. That play followed a 25 yard catch by Kelvin Benjamin and set up a TD run for McCoy from inside the Jaguars 5. With 4:15 remaining in the first, Bills lead 7-3. Fournette and the Jaguars would manage just a single first down on their next drive, before punting the ball back to the Bills. The first quarter ended with Buffalo converting a huge 3rd & 1, on a drive that began at their 9 yard line. Tyrod would connect with both tight ends on this drive, Charles Clay & Nick O'Leary, and Mike Tolbert would see three straight carries on the Jaguars side of the field, setting up a Steven Hauschka 37 yard field goal. McCoy is bothered by his ankle injury, but Bills extend their lead 10-3. Jacksonville would manage a 10 play drive that features 7 Fournette carries, a 17 yard reception by Allen Hurns and a 12 yard scramble by Blake Bortles on 3rd down. All of that set up an 8 yard TD pass to TE Marcedes Lewis. Jaguars & Bills tied at 10 with 5 minutes remaining in the first half. Without McCoy, the Bills would manage to move the ball to midfield, but would be forced to punt, but the Jaguars couldn't manage a first down and punted the ball right back to Buffalo, deep in their own territory. They would run the clock out. A quick three and out to start the second half by the Jaguars would set up the Bills at their own 41 on their first possession. With LeSean McCoy back on the field, they would drive to Jacksonville's 36 before kicking a 52 yard field goal. Bills take a 13-10 lead midway through the third quarter. A handful of three and 4 yard carries for Fournette and a 17 yard completion to Marqise Lee would set up a Lambo 52 yard field goal. Jacksonville ties the game at 13. The Bills next possession was stalled by a false start and a holding penalty, which forced a punt with under a minute remaining in the third quarter. A sack and a holding penalty would also prevent the Jaguars from getting anything going on offense, and they would be forced to punt from inside their 25 yard line. Starting at their own 33, McCoy would gain 10 yards on two carries and followed that up with a 48 yard touchdown reception. After the extra point, Buffalo leads 20-13 with 9 minutes left. The Jaguars next drive lasted 12 plays, including two 20 yard completions to Lee and Lewis, and was capped off by a 3 yard Leonard Fournette touchdown run. Jaguars and Bills tied at 20. Buffalo would punt on their next possession, on a drive that saw LeSean McCoy sidelined again. A Blake Bortles fumble, recovered by Kyle Williams, would set the Bills up inside the Jaguars 30, with 2:26 remaining in the game. After a 21 yard catch by Benjamin, McCoy return to the huddle and scored on a 6 yard run. With less than 2 minutes left, Buffalo leads Jacksonville 27-20. 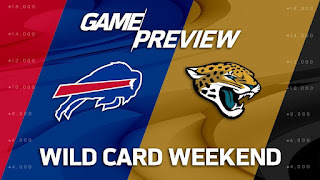 Bortles pass on 2nd down was intercepted by Micah Hyde and with 1:15 left in regulation, the Bills had the ball at the Jaguars 14 yard line. Just needing to run the clock out, the Bills were called for a holding penalty on their first play of the drive. Using all three of their timeouts, Jacksonville forced the Bills to kick a 39 yard field goal. With :46 seconds remaining the Jaguars trail by 10. There was nothing Bortles and the offense could do and time would expire on their amazing season.